Certification and awarding of the Q Quality Label to the Ikion Eco Boutique Hotel of Alonissos in Greece. 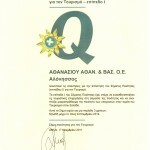 On November 17th 2011, Ikion Eco Boutique Hotel was the first Hotel in Alonissos to be qualified with the Q Label. “ The Quality Certification for Tourism” and the Q Label come to crown the quality services Ikion Eco Boutique Hotel offers in the field of tourism. The Q Label reflects the top level of the services Ikion Eco offers,as it functions according to the advanced criteria of Swiss tourism, which are the highest in Europe. “The Quality Certification for Tourism” and the Q Label are represented in Greece by Mr. Giannis Agglos. Consultant on tourism issues, former EOT Secretary General. The realization of the program has been appointed to I-LEARN. For “The Quality Certification for Tourism” and the Q Quality Label, procedures in accordance to the international standards set by the Accredited Certification Institution, were followed. Ikion Eco Boutique Hotel certification aims to reassure the confidence in the quality of the services provided and to the broadening of the knowledge on different approaches in quality management. Furthermore, it aims to create especially designed services addressing to specialized types of visitors. Through the certification above, the complete and continuous quality of the services provided by Ikion Eco Boutique Hotel to its clients worldwide is proved. By the Q quality Label Ikion Eco Boutique Hotel promises to its clients and partners, that the provision of services are characterized by the highest quality before and after the sale. In being awarded with the “Quality Certification for Tourism” and the Q quality Label for Ikion Eco Boutique Hotel , many factors such as the fully trained personnel, the organized processes within the company departments and the communication management of the company to its customers, played important role. The Management and personnel of Ikion Eco Boutique Hotel believe that in a world with rising competition the continuous application of quality management systems will contribute to the fulfillment of the company aims, in relation to the continual improvement of its services and its customers’ continual satisfaction. Quality is the foundation of the services sector for Ikion Eco Boutique Hotel and the Q label is a major asset for the company, which compensates its continuous effort to provide customers with services of the highest quality.